Whilst constant snacking isn't generally recommended as an alternative to regular well-balanced meals, there are bound to be occasions when you simply don't have the time or inclination to cook a whole meal. Instead, you just need to grab something quickly to keep you going. Snacks don't necessarily have to be full of fat and sugar; there are plenty of healthy alternatives that can provide your body with a boost that is packed full of good stuff. The key to healthy snacking begins on shopping day. Many people end up snacking because they simply don't have anything that's quick and easy to prepare in the cupboard. A quick stop at the corner shop for some crisps and chocolate takes the place of a meal and this is why snacking has a bad reputation. However, if you plan for the odd snack you can shop accordingly and that way you'll always have something ready to go in an emergency. Here are some ideas for quick snacks that can be planned in advance and added to your shopping list. If you find yourself heading straight for the chocolate counter when you fancy a snack then try to swap the chocolate bar for a more healthy cereal bar. If you buy these in packs when you go shopping, it should work out cheaper than your daily chocolate fix, as well. Keep a couple in your bag and you won't be tempted to stray! Many nuts are packed full of nutritional goodies and their high fat content makes them a pretty good source of energy, too. 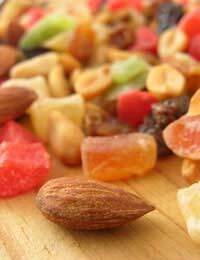 Keep a couple of bags of mixed nuts, or your favourite variety, in the cupboard for an easy snack. Even if you don't have time to cook a meal, you can surely spare a couple of minutes to chop up some celery, carrots, peppers and broccoli. These are all great for snacking and they work well with a tub of hummus for dipping. This is another good staple to have in the cupboard. Try and find brands that don't have added sugar - you'll be surprised what lurks on some food labels. A quick and easy solution to hunger pangs. A handful of breadsticks or a couple of pittas (warmed in the toaster and then sliced) will keep you going until dinnertime. Choose any dip or a tomato salsa to accompany them. Nothing beats a nice piece of fresh fruit when you fancy a snack. As most fruit contains lots of natural sugar, you'll get that energy boost without having to resort to chocolate or biscuits. Bananas are particularly good. As long as you think about what you're eating and try to maintain a well-balanced diet, snacking needn't always be bad for you. In fact, it's better to stop and have a snack than to carry on with a rumbling stomach and not be able to concentrate. Choose fresh fruit, nuts and cereal bars for when you're out and about as you can easily carry these around in your bag.